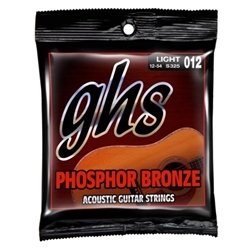 Newly improved GHS phosphor bronze acoustic guitar strings are crafted from a special, durable alloy of copper, tin, and phosphorus that's wound over a hex core. This GHS alloy combination delivers long-lasting, rich, and bright tone. The redesigned core-to-cover ratio gives GHS acoustic guitar strings increased brightness and flexibility without harsh overtones. GHS knows that you want your strings to be as fresh as the day they were made. All GHS facilities are environmentally regulated to control temperatures and humidity. Sensitive raw materials and bulk products are further wrapped in protective bags for storage. Coiled strings are placed in string packets that, in independent laboratory tests, have proven to offer the optimum protection from humidity.